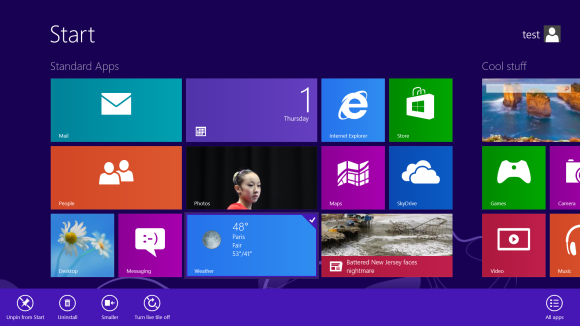 Windows 8 has features and behaviors that conspire to perplex even the most experienced PC users. Not all of them are bad, but a few of them are immediately intuitive. Making matters worse, the OS was primarily designed for touch control, and as a result, many mouse and keyboard commands feel like tacked-on afterthoughts. 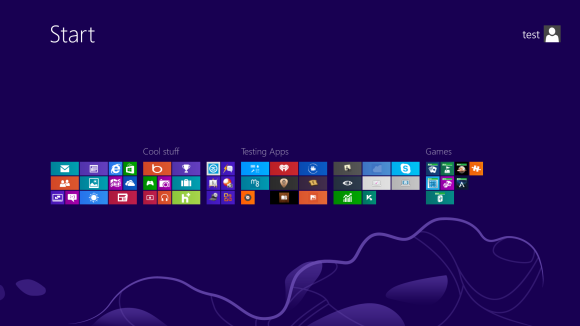 We’ve assembled a list of our favorite Windows 8 shortcuts, tricks, and workarounds. Now let’s start our journey of discovery with a look at easy-to-use (though often tough to remember!) Windows 8 hotkey commands. 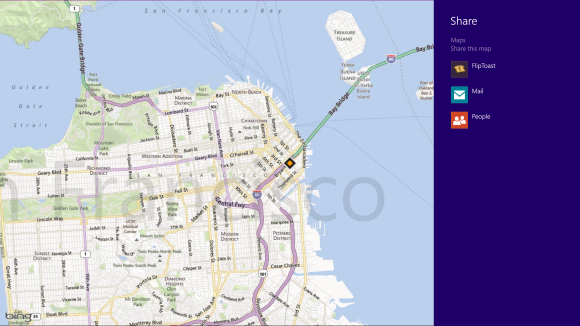 See all your tiles and groups at once with semantic zoom. 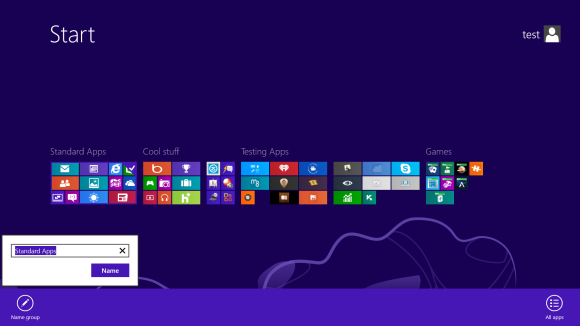 The Start Screen is full of nice, big, chunky tiles that represent all your apps. 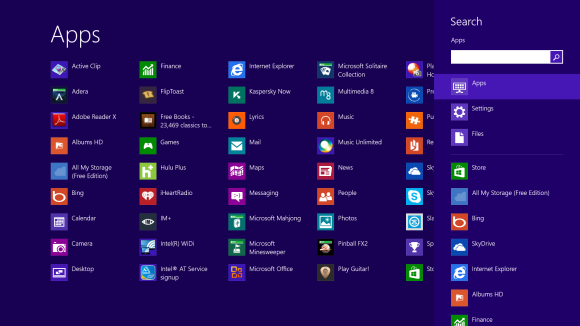 The tiles are easy to see in small groups, but what if you have hundreds of apps installed? Most will be hidden from view, unless you want to do a lot of scrolling. Enter the new semantic zoom feature. If you’re using a touch display, squeeze the Start screen with two fingers to receive a bird’s eye view of your entire screen contents. And the feature is also available to mouse and keyboard users: Simply hold down the Ctrl button, and use your mouse wheel to zoom in and out. Start screen customization for the organized. First, drag all the tiles you want to assign to a single group to the far right-hand side of your Start screen in vacant territory; the OS should sequester the tiles together. Once you’re satisfied with your assembly, use semantic zoom (described above) to get a bird’s eye view of your desktop. Now right-click the group (or simply drag down on it), and select the “Name group” option on the left of the bar that appears below. Type in the name, and enjoy your newly organized Start screen! 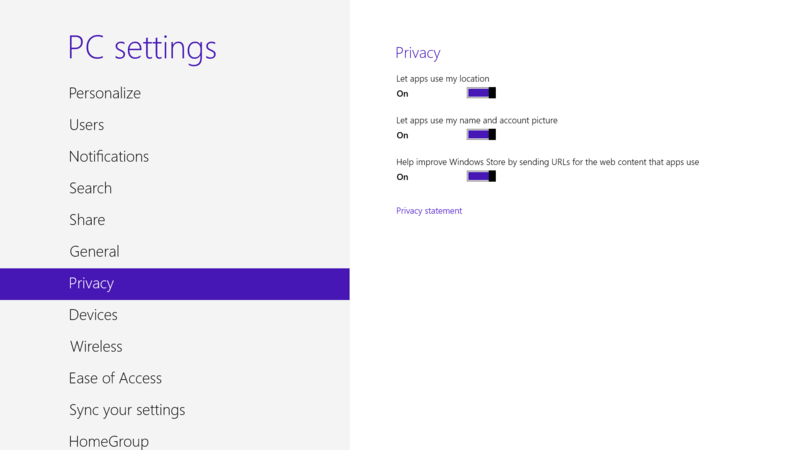 Closing an app sounds simple enough, but you’ll quickly notice that close buttons are hard to find in Windows 8. That’s because Microsoft encourages us to run apps in the background where they’ll take up minimal resources, but still be accessible at any time. Nonetheless, if you insist on being rebellious, you can close an app by dragging it with your mouse or finger from the top of the screen all the way down to the bottom. As you drag, the app will miminize into a thumbnail, and when you reach the bottom, it will disappear from view. Alternatively, you can still close apps via Alt + F4 and through the Task Manager. Search for anything in any app from one place. Oh, and how’s this for cool? You don’t even need to hit the Charms bar to access Search. From the Start screen, simply start typing, and you’ll be quickly whisked to the text-entry field for search queries. Try it. It works! Customize your privacy settings to your liking. A lot of apps tap into very personal information by default. Indeed, your pictures, location, and name are liberally woven throughout the system, and like many users you may not be comfortable trusting your machine with that much sensitive data. To adjust the settings, press the Windows key + I, and go to Change PC Settings. Select the Privacy option, and personalize the settings for your personal data there. Choose your own level of safety with SmartScreen. 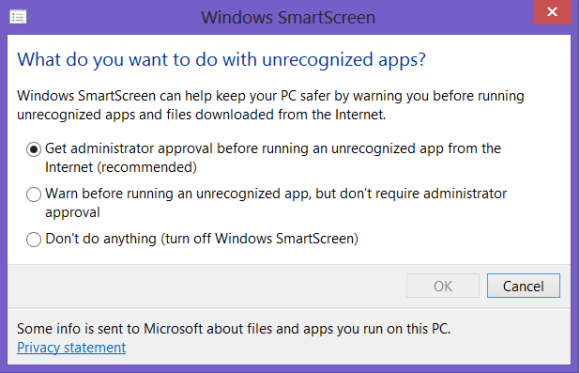 SmartScreen warns you before running an unrecognized app or file from the Internet. While it’s helpful to be aware of a file’s source, constant warnings can also get a little annoying. By default, you need an administrator’s permission, but this can easily be adjusted to just a warning or no indication at all. Using the magic search function described above, type “security” at the Start screen and find the “Check security status” in the Settings tab. From this area, you can adjust various security settings, including the Windows SmartScreen. The secret Start button for power users is hidden at the bottom-left. 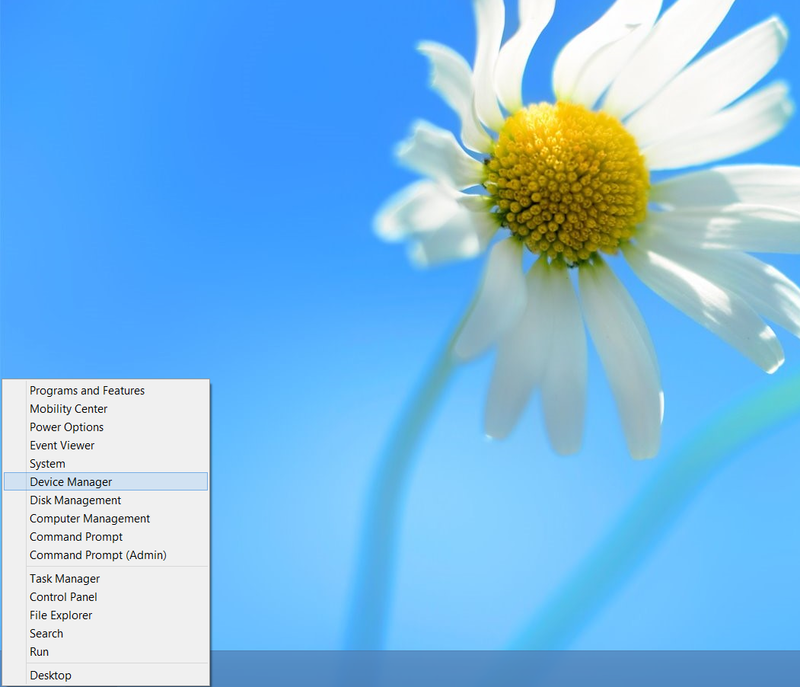 Right-clicking on the lower left of the screen—whether you’re in the Windows 8 Start screen or in the desktop—will bring up the Quick Access Menu, which enables a direct line to many key system management chores, including Disk Management, Task Manager, Device Manager, and Control Panel. Because the Windows 8 experience is split between new Windows 8 Store apps and old-school desktop apps, the operating system is prone to some strange behaviors. Case in point: When running a multimonitor setup, Windows 8 apps will consume your main screen, leaving your secondary screen running the desktop. This arrangement would seem to allow full-screen multitasking among both types of apps—a modern app on the left side, a desktop app on the right side—but this isn’t the case. Indeed, as soon as you begin using the desktop on your secondary screen, the new-style Windows 8 app disappears, and your primary screen begins running the desktop. But here’s a workaround. 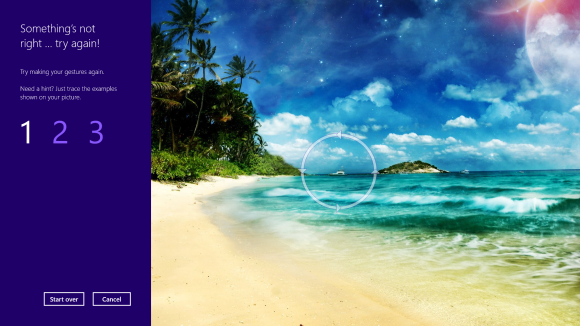 On your primary screen, use the new Windows 8 split-screen “snapping” function to run the desktop and a new Windows 8 Store app together. The desktop can take up the left-hand sliver, while the Windows 8 app consumes the majority of the screen. Now use your second display for a full desktop view. In this arrangement, you can fully multitask between new-style apps and desktop apps, and both windows will be large enough to be useful. Task manager is more useful than ever. You no longer have to run the MSConfig program to change startup items. 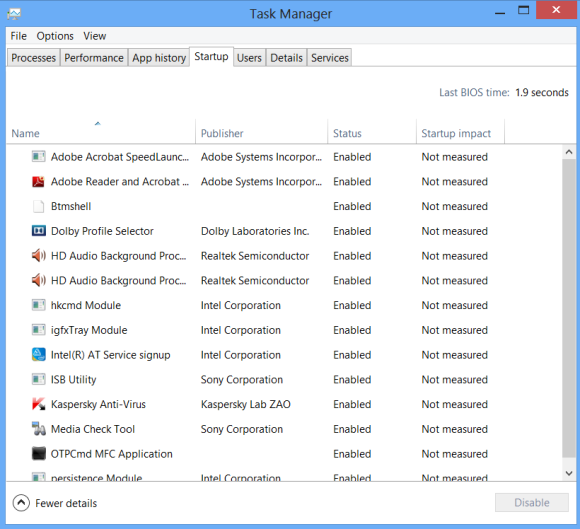 Startup items now show up in a tab on Task Manager. Simply press Ctrl + Alt + Del and select Task Manager. Click the “More details” tab at the bottom and find the Startup tab at the top. Using a picture password is a fun way keep your device secure while not having to remember a complex password. To enable it, press the Windows key + I to get to the settings charm. Click “Change PC settings” at the bottom right, and go to the Users tab. Under “Sign-in options” will be the “Create a picture password” button. This will give you the option to choose any picture, and then define three gestures anywhere on the image. Your gestures can be circles, swipes and clicks. Go to the start screen and type in “schedule” to search for Schedule Task in Settings. Click on Task Scheduler Library to the left, and select Create Task. 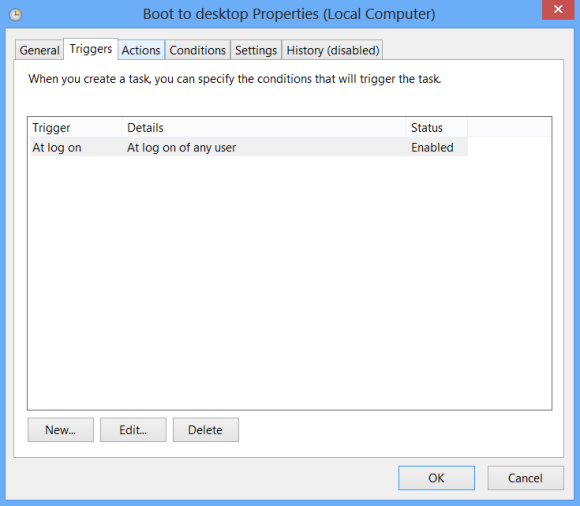 Name your task something like “Boot to desktop.” Now select the Triggers tab, choose New, and use the drop-down box to select starting the task “At log on.” Click OK and go to the Actions tab, choose New, and enter “explorer” for the Program/Script value. To speed up the log-in process, you may want to disable the username and password log-in screen. You can do so by opening the Run window (press the Windows key + R) and typing in “netplwiz” to access the User Accounts dialog box. Uncheck the box near the top that says “Users must enter a user name and password to use this computer.” Click OK, and enter the username and password one last time to confirm your choice, and you are all set for easy access to your system. In order to perform the refresh, go to Settings and click the Change PC Settings tab near the bottom. Select the General tab and find the “Refresh your PC without affecting your files” section near the middle (you may also select “Remove everything and reinstall Windows” to get the true factory settings treatment). 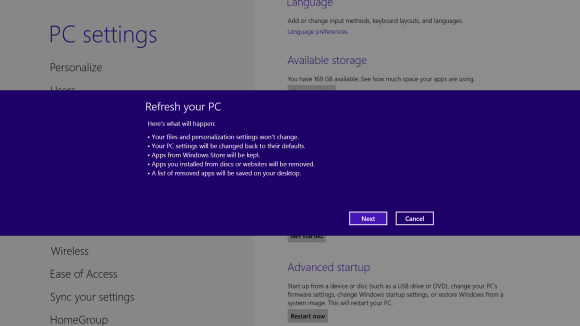 Select “Get started” and press “Refresh.” After a few minutes the PC will restart, and you will have a fresh copy of Windows 8. Safe Mode is a great way to get into your system when something won’t allow you to start up normally. Troubleshooting becomes a breeze when corrupted drivers and files aren’t loaded that prevents a system from functioning. It used to be as easy as pressing F8 when the system starts up, but doing so with Windows 8 will take you to Automatic Repair Mode. The trick to getting back to good old fashioned Safe Mode? Hold down the Shift key and press F8 while booting up. This takes you to the Recovery mode. Select “advanced options,” then “troubleshoot,” then the “advanced options” again (there are a lot of advanced options). Select Windows Startup Settings and finally the Restart button. This will reboot the computer and give you the option to boot into Safe Mode. If you need to get into Safe Mode from within Windows, open the dialog box (the Windows key + R) and type “msconfig” (no quote marks). Select the Boot tab and check the Safe boot box. The system will continually boot into Safe Mode until you go back and uncheck the box. Currently, the games folder used in Windows 7 isn’t present in Windows 8. Fear not; if you install any current-generation PC game that would regularly save to this folder, the folder is automatically created. For a quick way to find it, right-click on the game icon on the Start screen and choose “Open file location” at the bottom. Let your kids play without having to worry. Want to avoid some nasty surprises on your credit card? Create a separate, standard account on the device for your kids (Family Safety can’t be applied to an administrator account). You can activate Family Safety by going to the Control Panel, User Accounts, and Family Safety, and selecting the account you would like to apply it to. 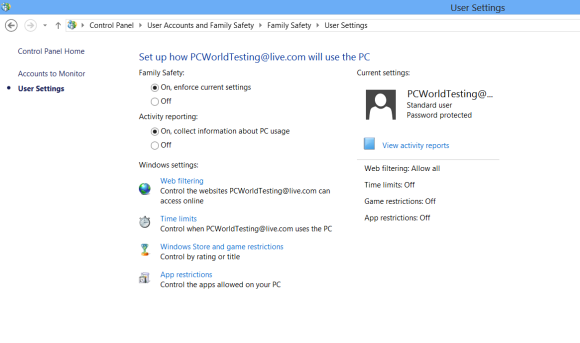 From these settings you can get reports on the account’s activity; set a level of Web filtering; set time limits; and enforce Windows Store, game, and app restrictions. Easy to create button to shut down. Windows 8 hides the Power button in the Settings menu, forcing a multistep process just to shut down one’s PC. But thanks to a crafty shortcut trick, you can pin a Shutdown button right onto the bottom of your desktop. Here’s how. Create a shortcut on your desktop (right-click, go to New, then Shortcut). Enter “shutdown /s /t 0” (with no quotes, and, yes, that’s a zero not an “O”) as the location of the item, and press Next. Now name the shortcut (preferably “Shutdown”) and press Finish. Right-click the shortcut, and navigate to Properties. Choose Change Icon in the Shortcut tab, and then OK to leave the warning box. Choose an icon of your choice from the list. In the screenshot above, you’ll see we chose a Power button. Right-click the shortcut again, and select Pin to Start. You can place the icon on your Start screen wherever it’s convenient. Clicking it will instantly shut down your computer.